Most window air conditioning units on the market are designed for vertical windows that open up and down such as double-hung windows. If you already have some of these air conditioners and want to place them in a casement window (or sliding window), you can follow this guide on instructables.com. But if you’re looking for a new window AC, we’d highly recommend you buy a unit which is designed specifically for that. A casement air conditioner is similar to a window and wall air conditioner with one big exception: they are meant for use solely with casement windows that swing out to the side or slide open sideways. They are tall and thin as opposed to traditional window units which are short and wide. They’re also much more expensive and less energy efficient than window units at the same Btu rating. 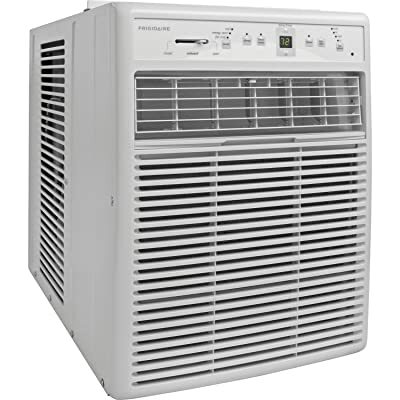 The Frigidaire FFRS1022R1 is one of the most popular casement room air conditioners in the US. It’s the perfect solution for cooling a room up to 450 square feet with sliding windows. This unit provides consumers with a fresh design and many great features that work with any decor and meet the highest of expectations in both functionality and quality. That’s probably why it gets such great reviews from both owners and fellow professional reviewers. With an energy efficiency ratio (EER) of 10.4, this Frigidaire casement window air conditioner provides an efficient form of cooling. Depending on your location you can leave your entire room more comfortable for about $87 per year. For a maximum energy conserving performance, you can turn on the energy saver mode which reduces the use of the compressor until the room temperature is above your set point. Overall, the Frigidaire FFRS1022R1 is the best casement window air conditioner available, you can’t go wrong with this one. If you’re looking for a casement A/C to cool a smaller room approximately 350 square feet, grab the Frigidaire FFRS0822S1 8000 BTU. If our top pick is sold out, the Arctic King EWL08CRN1BJ9 is a very good casement window AC to consider. This unit is much cheaper but cooled a room almost as well as the Frigidaire FFRS0822S1. We also like that it’s Energy Star qualified air conditioner means it will use every watt effectively. 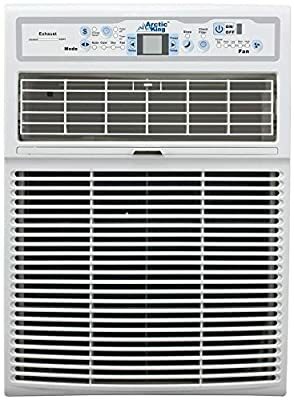 This 8,000 Btu window air conditioner is designed for cooling a room approximately 350 square feet. It cools a room very quickly – cooled entire our testing room in 20 minutes, you’ll enjoy full comfort in the hot summer. The Arctic King EWL08CRN1BJ9 features an electronic control panel with three operating modes cool, fan and auto. With “Follow Me” technology, a temperature sensor is built into the remote control to provide you with the most accurate thermostat reading. An easy-to-read control panel allows you to change settings at the touch of a button. It includes a convenient back-lit multi-function remote control that works in conjunction with the control panel. If you’re looking for an air conditioner to use in a small room such as a bedroom, get the Kenmore 77063 6,000 BTU Casement Window AC. This unit is designed for rooms less than 250 square feet. Now it’s only available on Sears. This casement air conditioner really has a lot going for it. It features a robust remote control with a built-in thermostat, allowing you to program the A/C to shut off when the temperature around the remote itself reaches the target. The sleep and energy saver modes allow you to efficiently run your unit all the time. The electronic controls, 4-way air direction, 3 cool speeds and 3 fan speeds allow you to find your ideal comfort setting. However, a few things held this model back from our top spot. At more than 60 dBA, it’s louder than the competition. In fact, many user reviews complain about the sound, so we’d think twice before putting it in a bedroom. If saving money is important in your choice of casement AC, this 10,000 Btu unit may be the right choice for you. It’s designed for a room up to 450 square feet. The Global Industrial Casement window AC is a small casement sliding window ac unit with several standout features. This model comes with a variety of settings, including an energy-saving mode, 24hr on/off timer, 3 cooling speeds, and 3 fan speeds. Its design is compact, but the unit still provides enough power to cool up to 450 square feet. This unit comes with a “follow me” remote control allows you to control your air conditioning unit from every corner of the room. It has electronic controls with LED display and a temperature sensing LCD remote control allowing you to conveniently see, set and maintain the room temperature from across the room. The Global Industrial Casement window AC is the most affordable casement window AC that you can buy. It’s slightly louder than the Frigidaire FFRS1022R1 but still quiet enough to use in the bedroom. Overall, it’s a decent option if you’re on a tight budget.